The East and South Asia region entered 2018 on a solid footing, posting the fastest growth rate in over three years in the first two quarters. The strong growth momentum reflected largely accommodative monetary conditions, robust global growth, tight labor markets and fiscal support in some countries. In H2, however, the region’s economic performance has been hit by the trade spat between China and the United, softer global growth, especially in Europe and China, higher oil prices and heightened volatility in the financial markets. According to an estimate for the region produced by FocusEconomics, ESA countries grew an aggregated 6.0% year-on-year in the third quarter, marginally undershooting last month’s estimate of a 6.1% rise. In Q4, our panelists also put growth at 6.0%. Overall, growth in the region is projected at 6.2% in 2018, only a notch below 2017’s 6.3%. The slight downward revision for the July–September period came on the back of weaker-than-expected dynamics in India, the latest large country to release GDP data for the quarter. Economic growth in India peaked in the March–June period and has faded since then due to slowing private consumption and a deteriorating external balance. Turning to the final quarter of 2018, economic growth remains soft, with most manufacturing PMI readings dipping into negative territory in November and/or averaging lower in the first two months of Q4 compared to Q3. Moreover, available trade figures for November show a broad-based deterioration. On a positive note, President Donald Trump and President Xi Jinping brokered an agreement in early December to freeze new tariffs for 90 days in order to restart trade talks. Therefore, the tariff hike from 10% to 25% on USD 200 billion in Chinese imports planned for 1 January has been temporally postponed. In the same meeting, Chinese officials also agreed on buying an unspecified amount of agricultural, energy, industrial and other products from the United States in order to reduce the trade imbalance between the two countries. Negotiators have now until 1 March to reach a trade deal or new tariffs will be imposed as threatened by U.S. trade representative Robert Lighthizer. While the truce has helped boost global economic sentiment, analysts warn that previous tariffs remain firmly in place and that the long-term rivalry between China and U.S. makes a comprehensive deal before the expiration date highly unlikely. While the East and South Asia region delivered an enviable growth rate for 2018 despite multiple economic headwinds, several persistent uncertainties could weigh on ESA’s economic performance next year. Firstly, despite a more conciliatory tone between China and the United States in recent days, the ongoing trade war between the two economic giants poses the main downside risk to the region’s economic outlook, especially among highly export-driven economies in East Asia. Softening domestic growth in China, which represents the bulk of the region’s nominal GDP and is a key economic partner for most economies in the region, could also dent economic dynamics in the region. However, the Chinese government’s initiatives to shore up economic growth should cushion the country against any sharp economic slowdown. Finally, monetary tightening in the United States has the potential to exacerbate capital outflows in the region, putting pressure on the region’s financial markets and prompting regional currencies to depreciate. Financial turmoil would be mostly felt in South Asia and Mongolia, as the economies in East Asia enjoy ample fiscal and financial buffers. FocusEconomics panelists expect that economic growth in the ESA region will decelerate from a projected 6.2% this year to 5.9% in 2019. While the estimate for the region was stable compared to last month’s forecast, this would represent the poorest performance in nearly two decades. In 2020, the ESA region is seen expanding a slightly weaker 5.7%. 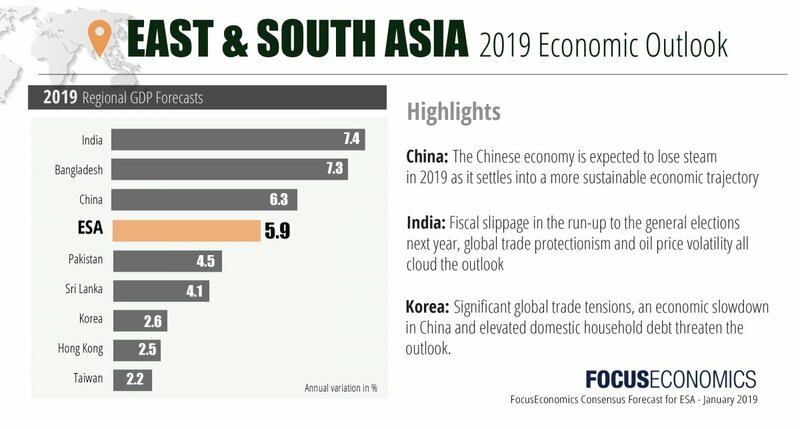 This month’s unchanged economic outlook for 2019 reflect stable growth projections for regional powerhouses China and India as well as for Bangladesh, Korea, Mongolia and Taiwan. Conversely, Hong Kong, Pakistan and Sri Lanka all received a downgrade this month. Bangladesh and India are expected to post the strongest expansions in the region next year, with growth rates well above 7.0%. China is seen expanding a solid 6.3%, while the more mature economies of Hong Kong, Korea and Taiwan are predicted to record the weakest growth rates, around 2.5%. A reprieve in trade tensions materialized at the G20 summit in early December, when the two economic superpowers agreed to a 90-day truce on new tariffs. However, major discrepancies between the two sides’ positions on key trade issues cast doubts over the armistice. Meanwhile, the economy continues to grapple with slower growth dynamics. Following a softer Q3 GDP reading, data for Q4 tells a similar narrative. A weak turnout in retail sales in October, despite the increase in the minimum threshold for paying personal income taxes on 1 October, and a drop in new yuan loans in the same month point to a slowing domestic economy. Nevertheless, stronger industrial production and a pick-up in fixed-asset investment in October suggest some of the government’s stimulus measures have begun to feed through. Annual economic growth slowed in the second quarter of fiscal year 2018, which ran from July to September, compared to the first quarter. The slowdown was due to a weaker rise in private consumption and substantially faster growth in imports of goods and services. Private consumption appeared to be weighed on by cautious spending among rural households amid a weak crop harvest and low agricultural commodity prices. Imports, meanwhile, were likely stoked by higher oil prices. On a brighter note, there were stronger expansions in public consumption, fixed investment and exports in the second quarter. Turning to the third quarter, the outlook appears mixed: Although the private-sector PMI hit an over two-year high in November, consumer confidence slipped in the same month. Overall, economic growth is expected to accelerate this fiscal year due to faster private consumption and investment growth. However, fiscal slippage in the run-up to the general elections next year, global trade protectionism and oil price volatility all cloud the outlook. Our panel expects GDP growth of 7.4% in FY 2018, which is unchanged from last month’s estimate, and 7.4% in FY 2019. Comprehensive data released in December highlighted that annual economic growth decelerated significantly in the third quarter compared to the second quarter, although this was partly due to a high base effect. The slowdown in Q3 was most evident in fixed investment. In terms of the fourth and final quarter of 2018, the economy has shown mixed signs so far. In December, the Bank of Korea’s business confidence survey posted the most pessimistic reading since January 2017, boding poorly for fixed investment. Furthermore, consumer confidence was pessimistic in both October and November and was at its most downbeat since February 2017 in the latter, which hints at mild private consumption growth. On the plus side, however, the unemployment rate ticked down for a second consecutive month in October, while industrial production rebounded. Turning to next year, higher government spending should boost economic activity. Moreover, although monetary policy will be tighter, it will remain accommodative by historical standards. However, significant global trade tensions, an economic slowdown in China and elevated domestic household debt threaten the outlook. FocusEconomics panelists forecast the economy will grow 2.6% in 2019, which unchanged from last month’s forecast, and 2.5% in 2020. Inflation in East and South Asia declined to a five-month low of 2.3% in November from 2.7% in October, according to a regional estimate. The print was mainly driven by lower price pressures in China, India, Pakistan and Taiwan. Inflation in Bangladesh and Korea was stable, while it increased in Mongolia and Sri Lanka. November data is still outstanding for Hong Kong, which could alter the final print. The Bank of Korea increased its base rate by 25 points to 1.75% at its 30 November meeting, which represented the first hike since November 2017. Although the Reserve Bank of India (RBI) opted to leave its interest rates unchanged at the 3–5 December gathering, this news was overshadowed by the resignation of the Reserve Bank of India Governor Urjit Patel on 10 December. While Patel stated that he did so for personal reasons, analysts warn that it reflects divergences between the Central Bank and the government over monetary policy, threatening to undermine investor’s confidence. Moreover, Patel’s resignation draws into question the independence of the RBI. On 11 December, Shaktikanta Das was appointed as the new governor of the RBI. In other news, on 30 November the State Bank of Pakistan hiked its key policy rate from 8.5% to 10.0% in an attempt to counter rising inflation; Sri Lanka’s Central Bank unexpectedly hiked its standing lending facility rate from 8.50% to 9.00% on 14 November, in order to support the currency amid a lingering political crisis; and the Bank of Mongolia hiked its policy rate by 100 basis points to 11.00% on 27 November, in an attempt to rein in inflationary pressures. Weak currencies in the region and high energy prices are expected to support inflationary pressures going forward. Panelists polled by FocusEconomics project average inflation of 2.7% in 2019, which is unchanged from last month’s estimate, and 2.7% again in 2020.